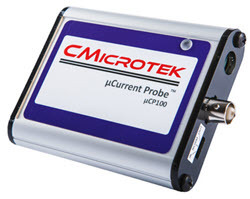 Summary: Keysight's new current probe handles a huge range and bandwidth. Keysight has a new and somewhat different offering. It's a fancy probe - really a probing system - for their Infinivision and Infinium oscilloscopes. The probe operates as one would expect: it monitors voltage drop across a sense resistor in series with the target board's power supply. Internal magic amplifies the signal over a wide bandwidth. But the sense resistor is built into a number of plug-in modules. 20 mO and 100 mO modules are included, plus one that lets you insert your own resistor. These are little SMT parts so one must be careful to not exceed the rated power. Keysight provides an Excel spreadsheet that simplifies the (simple) calculations. Keysight's scopes are highly integrated with the current probe - astonishingly so. The scope automatically changes the normal V/cm vertical display to mA/cm. You never see the drop across the sense resistor in volts as the scope does all of the work. And when the scope detects the probe it adds a number of additional metrics to the measurements window. In the following picture it displays peak to peak in mA, and total "charge" (Amp-hours) for the waveform displayed on the screen. I had the probe hooked up backwards (to see what would happen) and it correctly displayed this in -nAh. Keysight tells me (though it's not in the manual) that it can be used as a voltage probe as well, and has a sensitivity of 45 uV, with an astonishing 1.5G Ohm impedance. The probe only works with Keysight's 9000 H- and A-series, and 2000, 3000, and 4000 X-series scopes. These instruments have nine-pin connectors for each probe input that supplies information about the probe type and value of the sense resistor, as well as the software needed to make current and charge measurements.